John Henry Barnes was born on June 30, 1934 in Moncks Corner, South Carolina to Elizabeth Wright and Robert Barnes. He was the youngest of two children. John accepted the Lord Jesus as his Savior at an early age and confirmed his faith as a Member of Good Shepherd Reformed Episcopal Church Bonneau, in South Carolina. John received his early education at the Berkeley County Schools. He graduated high school Class of 1951 from Santee High School in St. Stephen, South Carolina. John, like most young men in the 40’s and 50’s joined the military. During his time in the U.S. Army, he fought in the Korean War, receiving numerous awards and decorations. After achieving the rank of Sergeant First Class, John was Honorably Discharged in 1956. Deciding to settle in San Diego, California after serving the nation John met and married the love of is life, Vera Mae Mullen. John and Vera were married on August 25, 1958 in Los Angeles, California. From this union John and Vera had three children Terri Lorraine (Barnes) Jones, Terrance Jerome Barnes, and Jennifer (Barnes) Vickers. John had a long career as a mechanical engineer. Working for Solar Turbine in San Diego, John held the positions of supervisor and eventually manager from 1965 until retirement in 1997. John also worked in the aerospace industry at Convair in San Diego. John received his Certificate of License to preach the Gospel and work in the ministry as a Reverend from Mount Pisgah Baptist Church in San Diego in 1968. John’s calling was to minister to the sick and spread the Lord’s word. On September 17, 1971, he received his Certificate of Ordination as Reverend by the authority of Mount Pisgah Baptist Church. John and Vera ministered as the Pastor of New Faith Baptist Church in San Diego. He was also the Pastor Emeritus at New Assurance Baptist Church at the time of his passing. One of John’s favorite pastimes was spent enjoying his children, grandchildren, great-grandchildren, and extended family members. John loved to attend various family functions held throughout San Diego County and the surrounding area. On April 8, 2019 at 8:30 A.M. John transitioned to be with the Lord. Preceding John in glory after forty-one wonderful years of marriage wife Vera Mae Mullen (from Louisiana) were; parents Robert Barnes and Elizabeth Wright; brother Thomas Barnes, Sr., all from South Carolina; son John Henry Barnes, Jr.; and granddaughter Shontay Lavonne Jones-McBride. 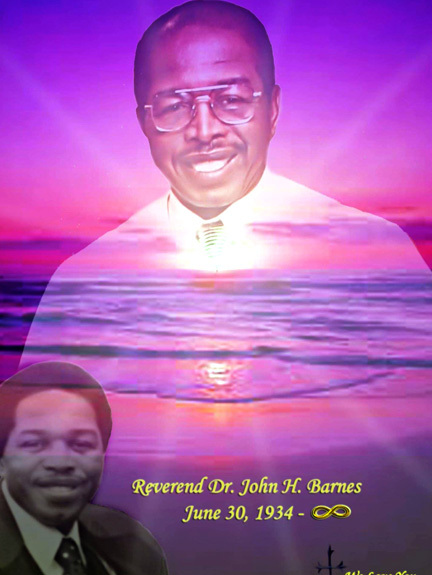 John Henry Barnes leaves to cherish his memory; four surviving children; two daughters Terri Lorraine (Terry Jones) Barnes, and Jennifer (Vickers) Barnes; two sons Terrance Jerome (Saundra) Barnes, and Danny Darnell (Nonie) Barnes. John also leaves sixteen grandchildren, and nineteen great-grandchildren to continue his legacy. Although John was not survived by blood siblings, he leaves five sister’s-in-law; four brother’s-in-law, including multiple nieces, nephews, cousins, and friends.